Overlap Wallpaper displays a photo on the desktop wallpaper in overlap manner, so that one can have the photo of loved ones on different wallpaper images on desktop. 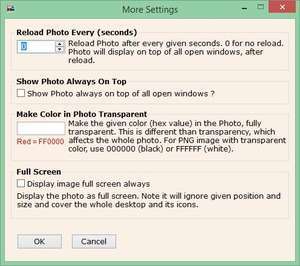 The overlapped photo can be sized and positioned on desktop as required. The photo can be made semi transparent. PNG image with transparent color is supported. Version 3.0.3 is a freeware program which does not have restrictions and it's free so it doesn't cost anything. For security reasons, you should also check out the Overlap Wallpaper download at LO4D.com which includes virus and malware tests. Additional screenshots of this application download may be available, too.